Blondie and Brownie: Stay Safe Friends! We hope that you all well stocked with the essentials: water, flashlights, cake, booze. Whatever you need to ride out the storm. I wish I had some of this cake on hand, it's a super awesome coffee cake from Miss Softee that's going to be in our upcoming cookbook. I do however have some Oreo Pumpkin Ice Cream (also most likely going in the book!) and a Costco sized box of brownie mix and a fridge full of homemade pizza. I've been loving reading what everyone has been cooking on twitter. What are you stocked up on? What are your storm essentials? 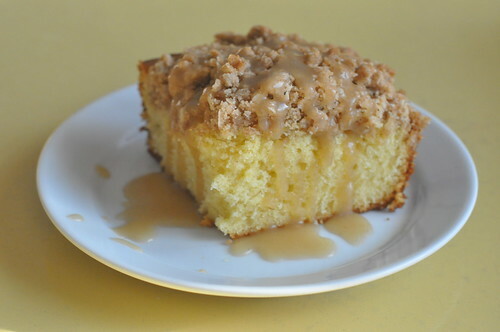 Wish I was having that coffee cake for breakfast right now! I think comfort foods are the best storm essentials! !